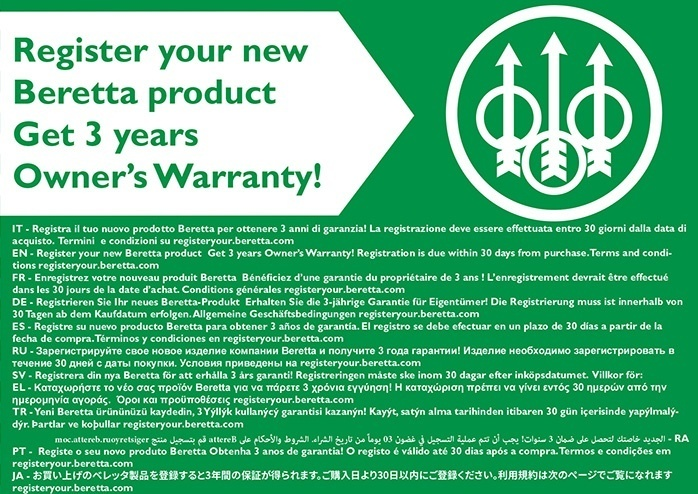 Register below your Beretta Product! By filling the form below you will be able to register your Beretta firearm by connecting with our database. Stay in touch with our community receiving our newsletter! 1. What is the Beretta product registration? The product registration offered by Beretta requires completing an online form that requires the entry of personal data and the serial number of your Beretta firearm. The information is in real time connected to our database. You cannot enter a product serial number that was purchased prior to the 1980's as these early records are not stored in a digital format. Information contained in the product registration PDF is in no way legally binding. 2. I have already registered my Beretta product on the local authorized distributor website. Should I register also on Beretta.com? If you have already registered your Beretta firearm on your local distributor website, you are not required to re-register on Beretta.com. However, by doing so, you will have access to exclusive content and benefits, available only to the Beretta community. 3. Can I register a second-hand (used) Beretta firearm?